The Lower American River flows through the scenic American River Parkway, but it is hardly a wilderness experience. You will see lovely river banks, flocks of ducks, and maybe a fish or two, but the most common wildlife sightings are of sunburned frat boys, squealing kids, and ubiquitous wielders of water cannons, super soakers, and good old-fashioned buckets. Most people rent rafts or kayaks for an easy day of water-fighting and floating on the water, but if you have your own stuff, by all means bring it! Who should go: Families, do-it-your-selfers, serious water-fighters. The only true rapid on the Lower American is San Juan Hole, a popular kayak surf spot when nothing else is “going off.” The American can actually be quite scenic, especially in the evening when the sun is setting. Read more about Lower American Whitewater. Consistent, year-round flows are released from the upstream Folsom Dam, so boating is an option year-round on the Lower American, although float trips are usually only popular in the hot summer months. Learn more about Lower American River Flows. Keep reading about Lower American Logistics. 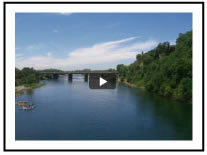 Watch a Lower American River video before you see it up close. 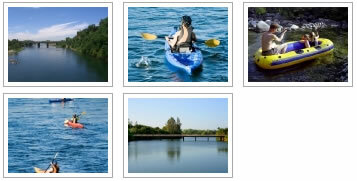 Buy and rent gear and other supplies for your rafting trip on the Lower American in Sacramento or Online.